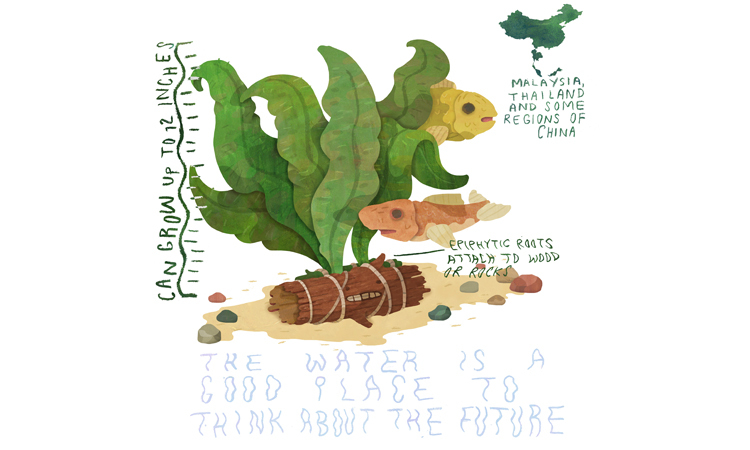 5.1 Q: Can java ferns grow out of water? 5.2 Q: Does java fern need extra CO2? 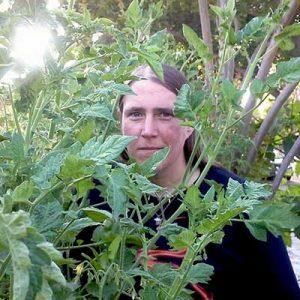 Those of us who keep aquariums around to enjoy fish swimming around have an unusual outlet for gardening right in front of us. Growing java fern in our fish tanks is a great way to bring greenery indoors. Besides, your underwater pets will love it! Deep green in coloration, these aquarium plants are a perfect back layer plant for a fish tank as it can grow to reach upwards of 13″ tall. 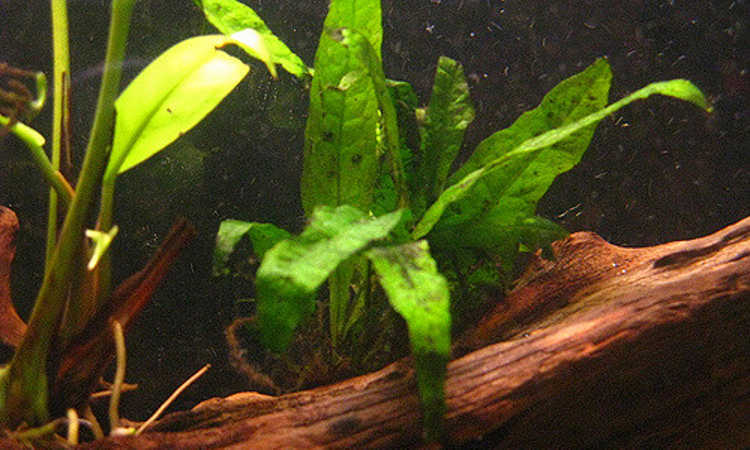 The swaying leaves provide cover for your aquatic residents as well as a splash of color in an otherwise dull-tank. Ready to grow your own underwater jungle? Let’s talk about everything you’ll need to know! 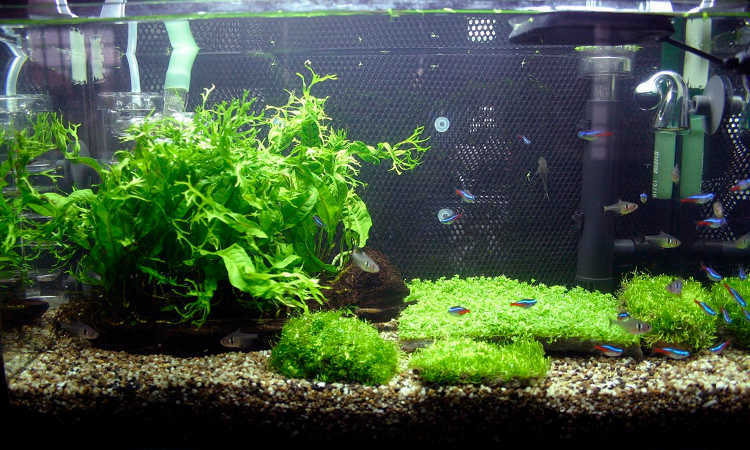 Now, let’s get into how to successfully grow this perfect planted aquarium plant! Quick care guide, custom-illustrated by Seb Westcott. Originating in Thailand, parts of China, and Malaysia, Microsorum pteropus is a variable water-loving plant. In the wild, it grows both submerged in water and partially above the surface, dwelling in boggy areas or along waterways. These plants consist of three basic parts: a root system, a rhizome, and the leaves. Tendril-like dark brown roots are used to attach the plant to its chosen medium. It doesn’t use its root system for absorbing nutrients as much as for simply hanging on, and these super-fine, hairlike tendrils do a great job of it. This rhizome forms the base of the plant and absorbs most of the plant’s required nutrition from the water around it. Over time, the rhizome will grow to cover whatever object the plant has grabbed onto, and can easily spread to reach 6″ wide. Leathery, dark-green leaves form the rest of the plant. They vary in shape depending on the plant’s origin and growing conditions. The leaves also form the reproductive portion of the plant, as they can form spores and develop plantlets directly on the leaf surfaces. While the length of the leaves is somewhat variable, these often reach 13″ or more in length, so are often used towards the rear of an aquarium. This is sometimes called “lace java fern” because of its fine leaf shape. Delicate and feathery, the windelov variety can be used in conjunction with broader-leafed varieties for visual appeal. Due to its finer leaves, this also tends to be a shorter plant. A broad-leaved variety, it is distinctive in that its leaf surfaces appear to be hammered. This variety is quite popular, but can be difficult to find. Trident has needle-like feathery leaves that sway in the water in an appealing way. This is what a lot of people think of when they think of underwater plants – long, swaying fronds which join together close to the rhizome. Very pretty variety. Slightly wider towards the leaf base than Trident is, Narrow has a similarly-flowing long and tapered leaf shape. It’s best described as an extremely elongated teardrop shape, and it’s slightly textured in a similar way to the Philippine java fern. Undulata is an interesting variety in that its leaves tend to be almost the reverse of the shape of the Narrow variety’s leaves. Pointed tips widen dramatically on the upper portion of the leaf, then gradually decrease until the leaf vanishes into the rhizome at its base. 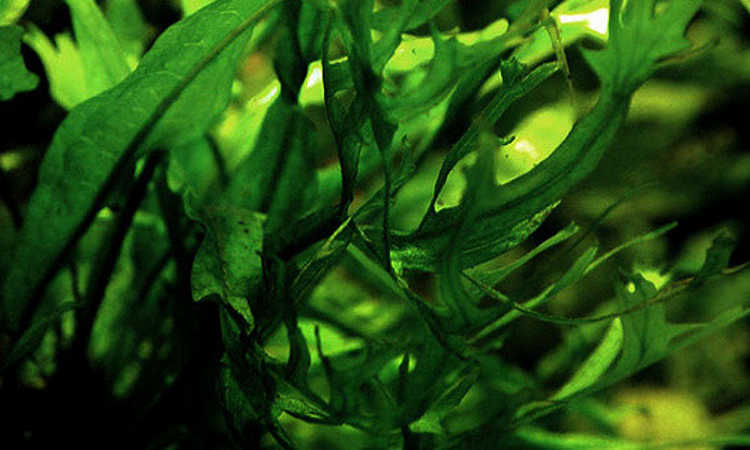 Considered among the easiest aquarium plants to grow, java fern is a fantastic addition to your planted aquarium. But it’s unlike many other sorts of plants. Let’s go over care conditions for your java fern and how to keep it healthy and lush! Whereas many plants love lots of sunlight, your java fern microsorum is actually a low-light plant. Too much sunlight, and your plant’s leaves will get burned. This can cause brown patches to appear, or in really severe cases the leaves will go transparent and begin to dissolve. A reasonable rule of thumb is to aim for 1.5 watts of soft lighting for each gallon of water in the tank, using small incandescent lights or soft fluorescents. If this still seems to be too much, consider back-lighting the tank with low-light LEDs and reducing your upper lighting even more. Temperature-wise, these plants love temperatures in the 70-75 degree range, but can tolerate anything from 60-83 degrees Fahrenheit. As java fern microsorum is an aquatic plant which can grow fully submerged in planted aquarium, it’s safe to say that it loves humidity! This holds true whether it’s fully or partially submerged, and its root system and rhizome should be in contact with water constantly for best growth. Generally, it will thrive if completely submerged in a fish tank or a pond, although the tips of its leaves can rise over the water’s surface. If too much of the leaf surface is exposed to the air, it may require additional nutrients to sustain itself properly. 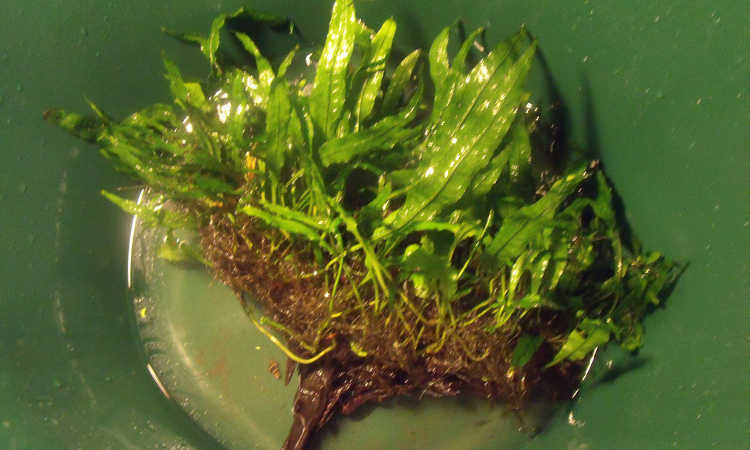 Fern microsorum pteropus can survive living in brackish, salty water but prefers fresh water. Salinity shouldn’t go above 1.00g, as your plant may show signs of leaf melt at higher levels of salinity. The pH level of your water should be between 6 and 7.5, as well. It’s important to change out 25% of your aquarium’s water every 2 weeks to remove any excess nutrients or fish waste and to keep the water fresh. Your java fern microsorum also loves oxygenated water, so aquariums with pump systems are ideal. It doesn’t need CO2 as much as other water plants. These plants are epiphytic, like Spanish moss or many bromeliads. It does not require soil at all to live, and in fact prefers its roots to be fully exposed and not buried at all. Generally speaking, the growing medium which is most common for these aquarium plants is either pieces of wood or large rocks. On occasion, it has been attached to decorative features made for fishtanks. Rather than planting this in the substrate of the tank, it’s advised that you loosely secure your java fern on driftwood or rocks with a piece of cotton thread. This keeps the roots in contact with the growing medium until it can develop a firm grip, and the thread will eventually rot away. Aquatic plants require four basic nutrients to grow. These are iron, manganese, nitrogen, and phosphorous. Sometimes, additional micronutrients such as copper, zinc, borate, or molybdenum are necessary as well. 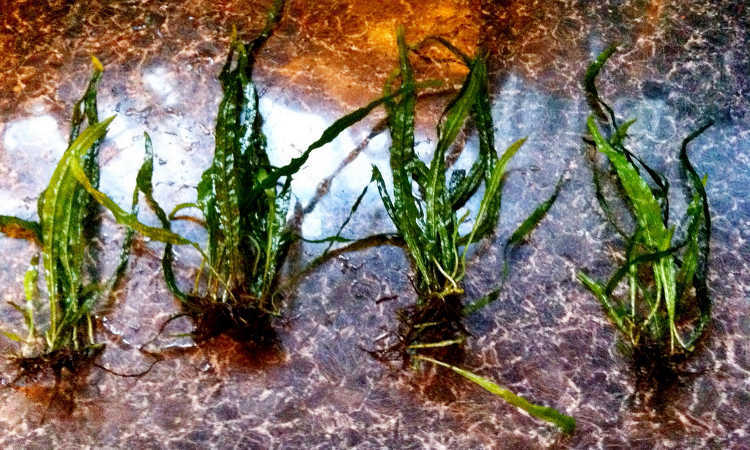 The fertilizer you’ll want to use for these aquatic plants is a bit different than a traditional fertilizer. Designed to be safe for fish as well as the plants, these come in two different formats: liquid and tablet. Liquid fertilizers may cause some clouding of the water or promote algae growth if you use too much of them. When in doubt, under-fertilize. Follow the manufacturer’s directions for your tank size. I like API Leaf Zone Aquarium Plant Food as it provides everything these aquarium plants need. Don’t use a standard liquid plant fertilizer, as it may be risky for your fish. As an alternative, there are tablet-type aquarium fertilizers. These slow-release capsules are buried in the tank’s substrate and will release their nutrients over a period of time. It takes some trial and error to determine where to bury the capsule in the tank. While a liquid fish fertilizer immediately spreads throughout the water, tablet varieties don’t always spread over the entire tank’s water supply. There’s a few varieties of fertilizer tablets on the market right now, but two good choices are Tropica Plant Care Nutrition Capsules for Freshwater Aquariums and Seachem Flourish Tabs. Both provide ample nutrition for your plants while being fish-safe. Whether you opt to use liquid or tablet fertilizers is generally a matter of personal preference, and both can work well. However, it takes a little practice to get used to these fertilizers, so be prepared for a trial and error period! The beauty of growing these plants are that they’re self-propagating. And they do so in a number of different ways. The tips of java fern micosorum pteropus leaves can develop dark bumps. These turn into young plantlets, and in fact look as though a second plant is growing out of the first. When they’re old enough, these plantlets will drop off the leaf tips and float around the tank in search of something to latch onto. In addition, leaves which are regularly out of water can form spores along their undersides. These spores can be carried via air or water to other surfaces, allowing them to easily spread. The rhizome of the fern microsorum itself will widen over time, increasing the size of your plant and the number of leaves which can be actively reproducing. Many growers find themselves with an abundance of young plants in time! With fern microsorum, repotting is more like securing and moving. As its roots don’t like being buried, you can instead secure young plantlets to driftwood or rocks with cotton thread. While doing this, be gentle. Don’t tie down the plants tightly as it can risk damage to the root structure. Instead, loosely secure the rhizome to the surface with the thread, ensuring that the roots are in contact with the surface. The roots will grab on in time as the thread rots away in the water. If at all possible, do this process working in a bowl of fresh water. This keeps the plant moist and the movement of the water helps it to fan out its roots comfortably. Once secured loosely to their growing medium, you can place them in outdoor shaded ponds or in aquarium tanks. Be sure that these are freshwater locations if at all possible. If using an aquarium, go for a 10-gallon or larger size rather than a small fish bowl so it has room to grow. Occasional light pruning encourages plant development. Remove larger leaves just above the rhizome to give it more energy to put towards growth. Don’t take too many off, but select just one or two of the largest leaves. Pruning in that fashion will in time result in a much larger plant overall, as the rhizome will have enough time to develop a larger base from which to send up leafy growth. 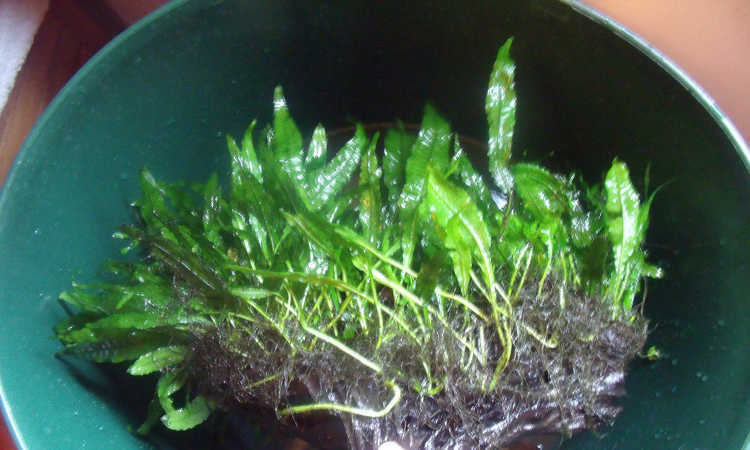 If java fern melt begins to appear, remove damaged leaves immediately by pruning them off just above the rhizome. 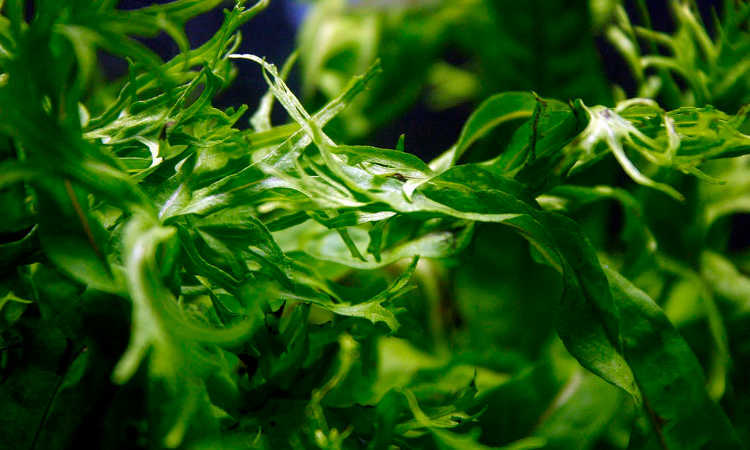 See the problems segment below for more information on java fern melt, as well as other ways to halt the damage it causes. Overall, your aquatic java fern microsorum won’t have many problems. But let’s go over what few may exist. Black lines running through the leaves of other plants may be causes of concern, but for java fern, it’s fairly normal. This plant can have dark-colored veins inside its leaves depending on which variety it is. They also can form brown or black bumps that will turn into plantlets. However, if the leaves start turning completely black or a drab olive green color, the plants are crying out for more nutrition. Use aquarium plant fertilizer per the manufacturer’s directions to remedy this issue. When we think of pests, normally they’re insects. But java fern microsorum pteropus doesn’t seem to attract insects. In fact, about the only thing which it seems to attract are snails who seem to like living amongst its leafy greenery. While snails won’t harm your java ferns, some tiny forms can be found clinging to storebought plants from time to time. But these snails can pose a problem to the fish in your tank or to other aquatic plants which you may have. Purchasing a single assassin snail for your tank can remedy snail problems. It will eat the tiny snails and continue to live in your tank, cleaning up leftover fish food and some forms of algae. Even the fish themselves are not tempted to snack on your plants. It’s believed that their tough leaf structure makes the plant unattractive for most fish to nibble on for very long, which means they tend to survive in most aquariums. While not susceptible to most common plant diseases, there is one thing which java fern does suffer from: java fern melt. If the leaves start to develop large brown or black spots, turn translucent or mushy, or start to dissolve and rot away into the water, there’s a few different possible causes. Let’s go over those now. Begin by being sure that you are not suffering from cyanobacteria in the tank. Cyanobacteria, also called blue-green algae, is caused by poor nutrient levels and creates a bacterial film over all surfaces of the fern and other parts of the tank. If you find cyanobacteria, peel away the filmy bacterial layer from the fern or other parts of the tank. 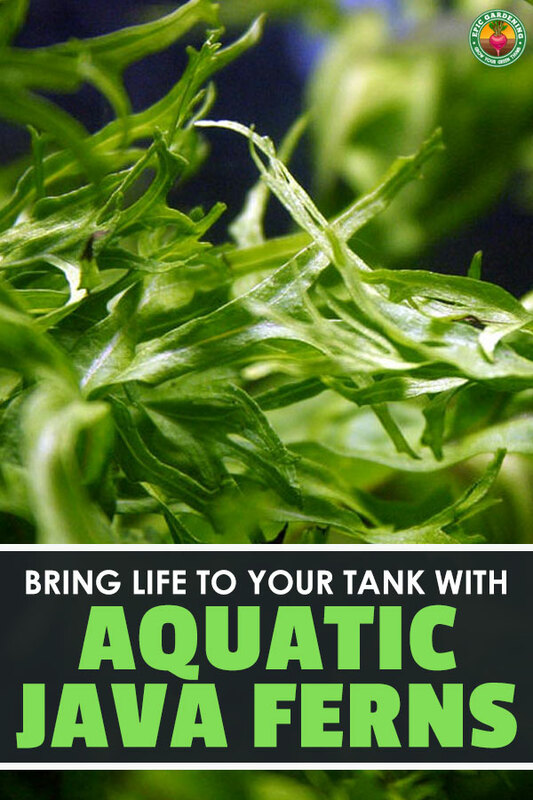 Change out 25-50% of the water in the tank, then fertilize and maintain good nutrition to keep this algae-like bacteria at bay. Poor nutrition itself can cause melt as well. If you maintain regular feedings for your plant, this should prevent this issue. Finally, excess bright light can cause translucent leaves and eventual melt. If this appears to be happening, prune off damaged leaves, then turn off all the lights (but not the water pump) and cover the aquarium with a blanket or towel to make a completely dark environment. Leave the lights off for up to three days to allow your plants time to recover. While melt is not easy to diagnose, ensuring that your water is regularly freshened, that your plants are fertilized, and that there’s no bacterial growth or excess of bright light should prevent further outbreaks. Q: Can java ferns grow out of water? A: Actually, they can — but it will need tons of water and possibly extra nutrients to keep it alive. Since the plant takes in most of its nutrition through its rhizome and leaves, you’ll want to keep the rhizome submerged and fertilized and mist the leaves with water to keep them hydrated. If you want to grow java fern in a partially-submerged fashion, ensure that there’s high humidity around the plants at all times. A fine misting system on a timer (like what’s in the produce section of a supermarket) works well for this purpose. Q: Does java fern need extra CO2? A: Most aquatic plants require carbon dioxide, aka CO2. This is produced by fish using the oxygen in the water as well as other sources. However, while CO2 won’t harm a java fern microsorum, it doesn’t need it as much as other underwater plants do. Java fern microsorum pteropus actually loves oxygenated water, especially if it’s lightly moving. They will absorb some of the CO2 waste that your fish may produce, but adding extra CO2 to the water isn’t required. Aquatic plants are a great way to bring greenery into your home, especially if you’ve already got pet fish. What’s your favorite type of fern microsorum pteropus, and have you grown this plant before? Let me know in the comment section!